You may remember a few weeks ago, Miss A held her giveaway in which the winner got to pick our next international destination. Well, now that we’re back home and in the swing of things (until school starting next week throws us out of swing again), we began our Japanese cooking adventure. I have to admit, outside of sushi, none of us knew much about Japanese cuisine. The only thing Mike remembered was tonkatsu which he used to order when he ate at sushi restaurants with his parents. Fortunately our prize winner, A_Boleyn, sent us several suggestions. Thanks A_Boleyn! So for tonight’s menu we have Tonkatsu, EggplantKatsu and Katsudon. But first, a few weeks ago we featured our go-to weeknight sandwich. 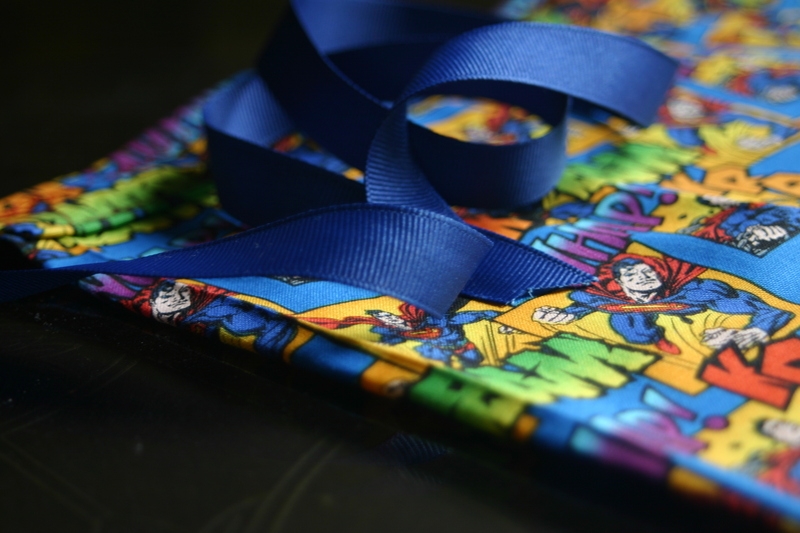 When we did, the Food Doctor from Chef in Disguise aptly quipped about my super hero cape. Well, Mike’s mom didn’t miss a beat and when we returned home from vacation I was presented with this awesome cape! I’m not sure, but I think it made this dinner even better. 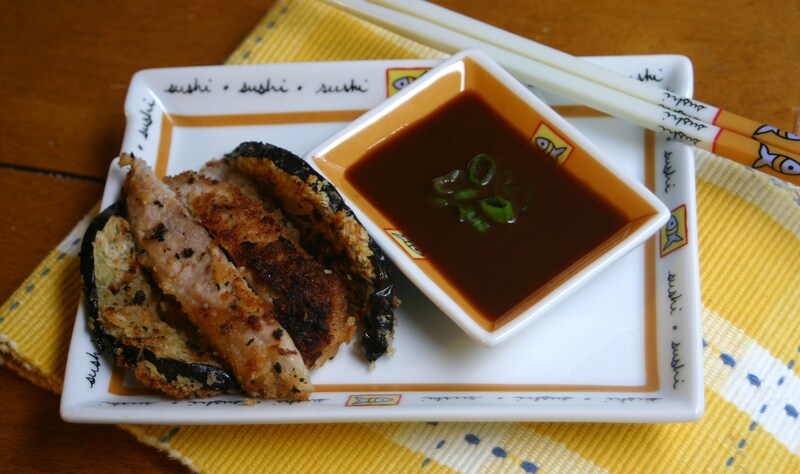 First we started with the tonkatsu and eggplant katsu – or fried pork and fried eggplant. We opted to try a bit healthier version and used only egg whites and panko for the coating. Mr. N took care of separating the egg whites for us. We started with the eggplant to prevent any potential contamination from the pork. 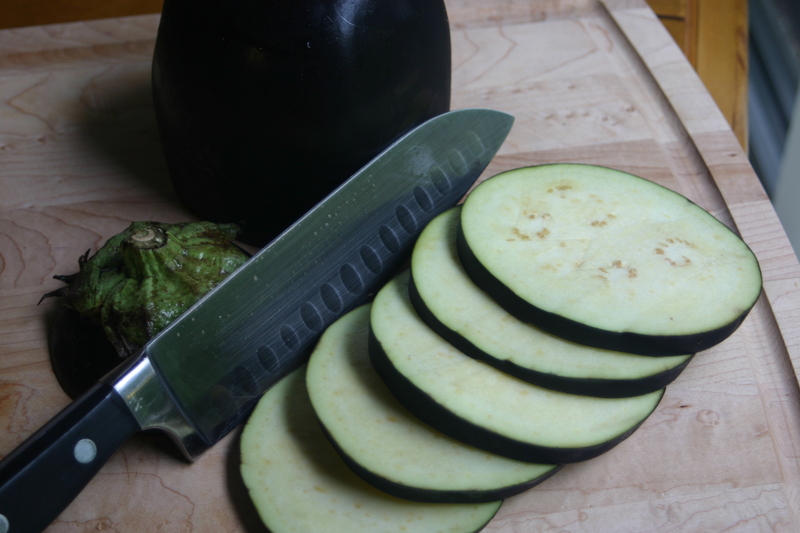 First we sliced about half of a large eggplant. 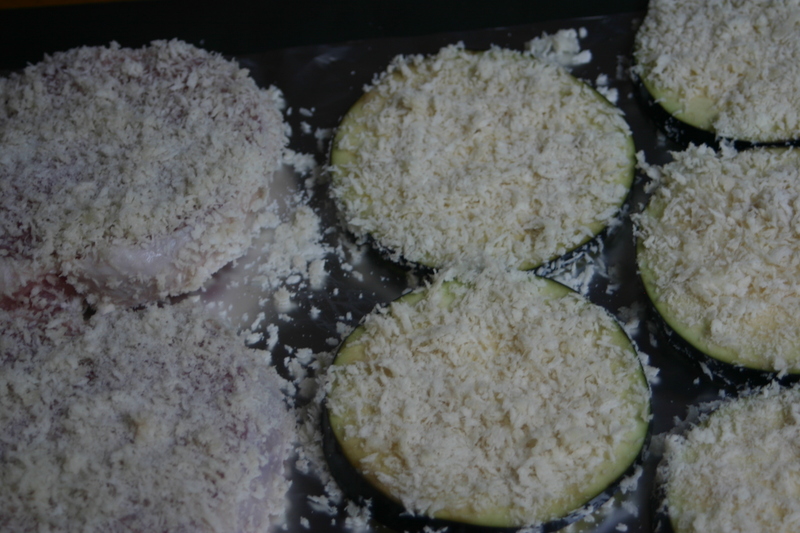 Once the slices were coated, we set the eggplant aside to begin the pork. 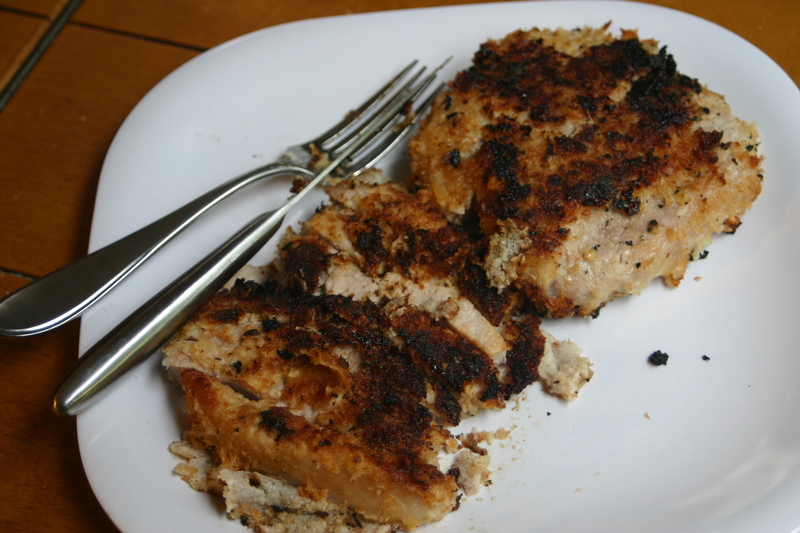 We used boneless pork chops and this time dad got in on the action, dipping them in egg whites and panko. We also let dad handle the frying where we again opted to tone down the calories. We fried the eggplant and pork (separately) in a bit of oil, rather than a deep fry immersion. The eggplant fried for about 15 minutes, flipping once. The pork took about 5 minutes per side. We sliced about half of the eggplant and pork into strips and set it aside. 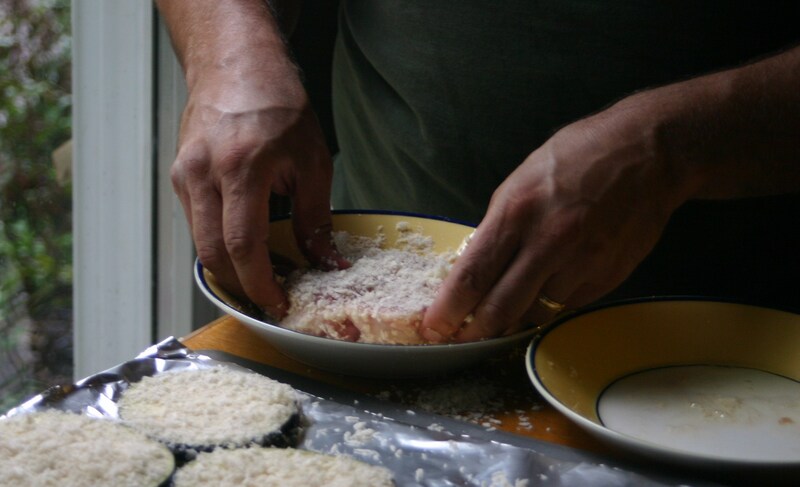 We then sliced the remaining tonkatsu and eggplant katsu to add to our donburi, or Japanese rice bowl dish. 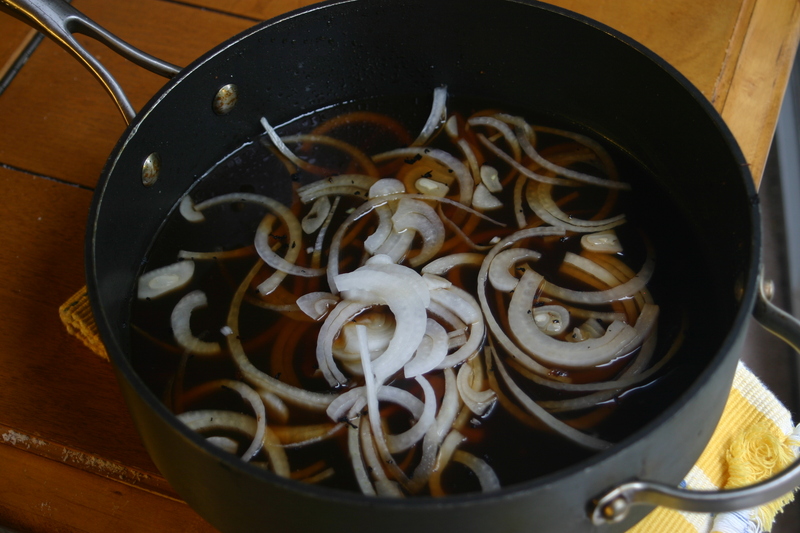 Next we added the donburi sauce to a skillet and tossed in some sliced onions. After cooking for a few minutes we added the sliced eggplant katsu and tonkatsu to the skillet and cooked for another three minutes or so. 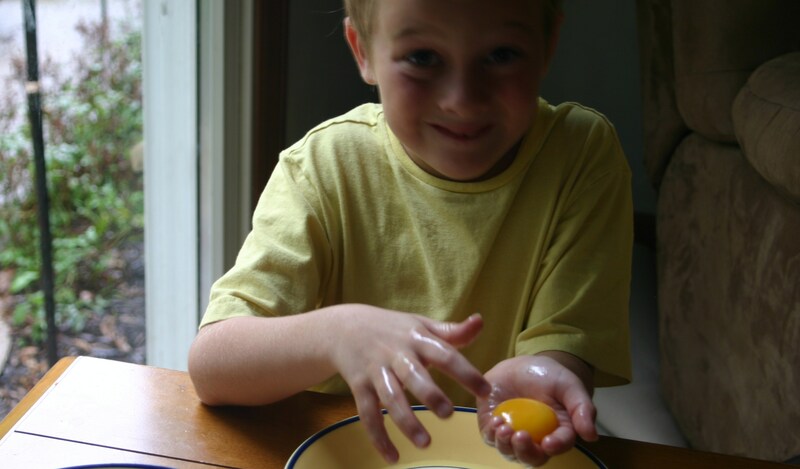 Lastly we whisked together three eggs and poured them over the contents of the skillet, covered and cooked for a final two minutes. We then divided the skillet into fourths and served it over Japanese rice topped with green onions. And there you have the katsudon. Dad and the kids ate the tonkatsu version, while I ate the eggplant version; but after sampling a bit of each, both dad and I preferred the eggplant katsudon to the pork. I’m even thinking next time I could just roast the eggplant, skip the breading and get an equally tasty meal with even fewer calories. Both dad and I gave this a solid 3 spoons. I was even teetering between a 3 and 4 spoon rating. The kids weren’t quite as happy with it; although they gave it an honest shot. They only ran in with 1 spoon. I think mostly because they’re not big on onions or rice. As for the rest of the tonkatsu and eggplant katsu, we served it with a tonkatsu dipping sauce which was much more up the kids’ alley. Both Miss A and Mr. N gave this version a 3 spoon rating. Dad and I only about a 2 spoon. We liked the katsudon much better. So it actually all worked out quite well, there was something for everyone. Our first foray into Japanese cuisine was a fun and successful little adventure – which of course wouldn’t have been complete without a little dessert. Kristy, I just love tonkatsu, never touch sushi. Eggplant terryacki might be tasty. Although I have never quite gotten the breading as light and crisp as the restaurants. Your mother-in-law must be very special to make that “caperon” for you. I bet she thinks you walk on water. No Trader Joe’s in my neck of the woods…Jewel it is! This looks like a recipe my family would enjoy. 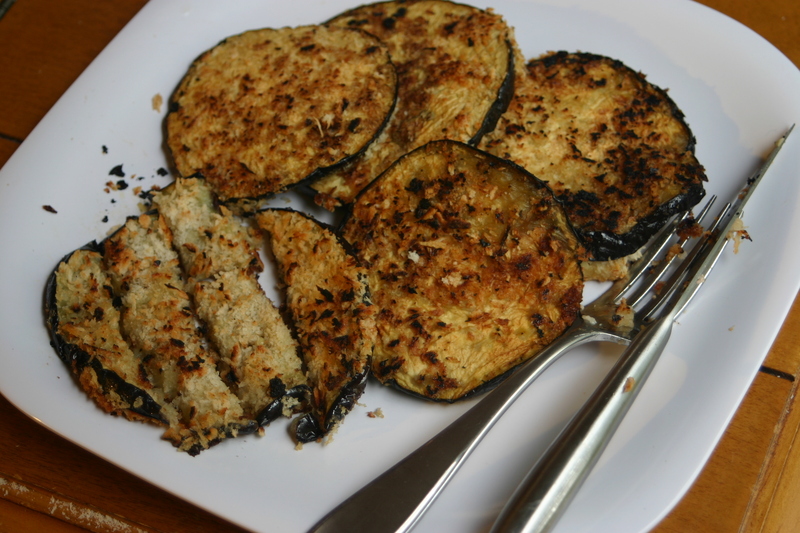 We love breaded eggplant. I made some the other day from our garden. I love your cape and Ms. A’s modeling pose! She is such a ham! I think the cap should be your future giveaway! lol Speaking of Trader Joe’s I need to make a visit there! Now there’s any idea for a future giveaway! 🙂 Oh! I would love to have eggplant growing in my garden. Actually, I would love to have a garden! LOL. and you did an amazing job on your Japanese trip..
LOL! I have to thank you – your comment sparked the whole thing. 🙂 And Miss is a riot. She just cracks me up. Great job on the Japanese cuisine challenge, Kristy! Everything looks fantastic…and that cape is hilarious. I might need to invest in one. Oh, and Trader Joe’s mochi is the BEST! Look at Miss A posing for the camera. I love this dish and it’s not a way I’ve prepared eggplant. She is a ham isn’t she?! It’s funny, usually if I tell her to smile at the camera she smiles in a different direction. (always the rebel) Somehow we caught her this time. You know I’m a huge fan of eggplant and never thought it would be included in a Japanese dish….probably because sushi is the closest I have gotten to eating Asian! This combo sounds so delicious! And whatever that mago machi is, it looks amazing!! Bravo, it looks so good and virtually easy-right? I love the eggplant and pork cooked that way. I think my hubby would go for the katsudun so I might give it a spin! It was pretty easy. It always takes extra long when you’re photographing and with the kids helping, but if you take those elements away it’s not too bad at all. 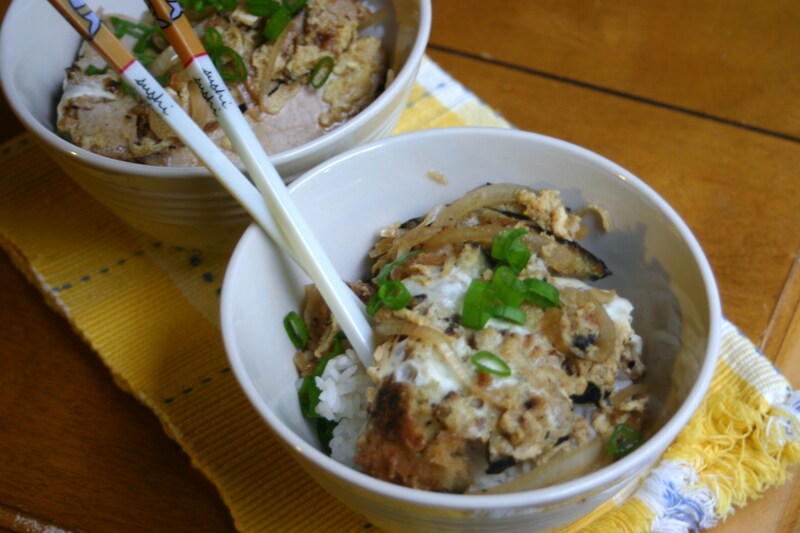 Like I said, next time I’m going to just roast the eggplant and make the donburi to go with it. Yummmy!! I must echo Kelly and her comments – exactly how I feel! Anyway, great post as usual! 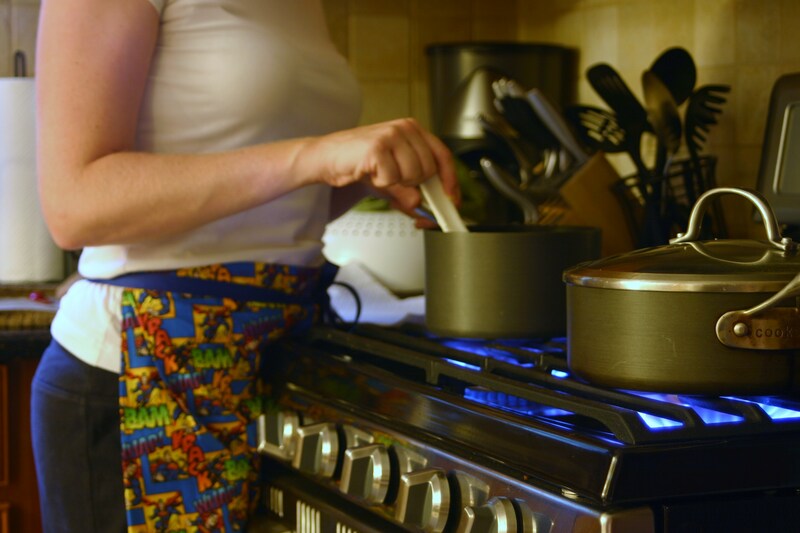 Kristy, this was such a fun post to read. I love the warmth of your family and the fact that your mother-in-law made you a super hero cape just adds to that wonderment – I just love it… and, I must say, you look fantastic in it!! 🙂 Kats meow indeed – everything looks so delicious and fun to make. Those sliced onions – yum – and the fresh green onions topping the dish, beautiful. (Pretty dishes too!). Another fabulous post super mom. 🙂 Thanks! I got a big kick out of it. Thanks Kelly! This was such a fun night. We all had a good time making everything. And the kids just love the cape too. I think they prefer when I where it cape-style to apron-style though. 😉 Lends to my credibility that I have eyes in the back of my head and can see what they’re doing at all times. LOL. I love eggplant, anywhich way! Looks like a very tasty recipe. I’m with you. I could eat eggplant every day. It’s easily one of my favorites! 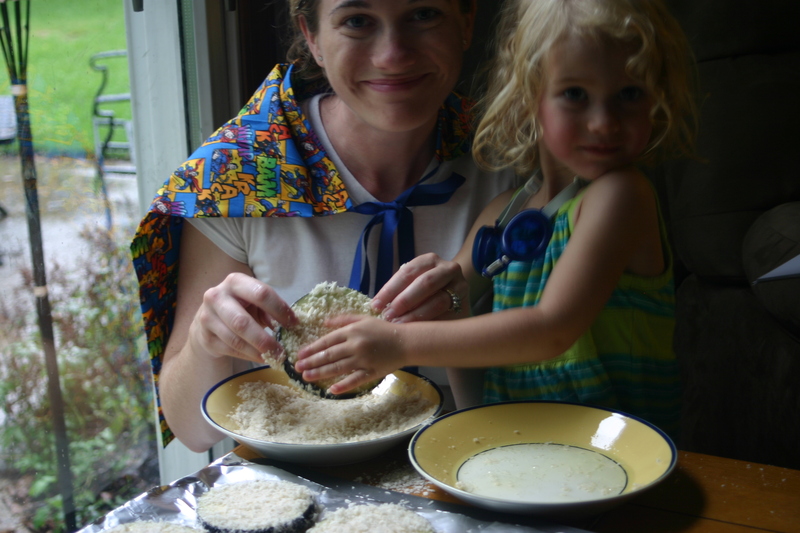 What a great read – I love your cape/apron. Thanks Mandy! 🙂 I love it too. Also, if you ever see it anywhere, you should buy and try some “Golden Curry” at least once. It’s this curry mix which comes in blocks which melt down, like chocolate (seriously). You just add some water and meat and stuff! The instructions are pretty basic on the box … are there any modifications you could suggest? Suggestions on Golden Curry? Hmm – not really to be honest. I remember adding “more” of the basic stuff they suggest. Carrots, potatoes, onion I think are the basics they suggest… I upped the quantities a bit and added extra stuff – maybe some turnip or celery, just to make it more chunky (even if it’s not necessarily “curry-like”. It’s already quite rich so you don’t need too much extra. If you have a hot one, it actually ends up being spicier than you’d think too, so you don’t need maybe quite so much curry chunks as they say. Interesting looking dessert! 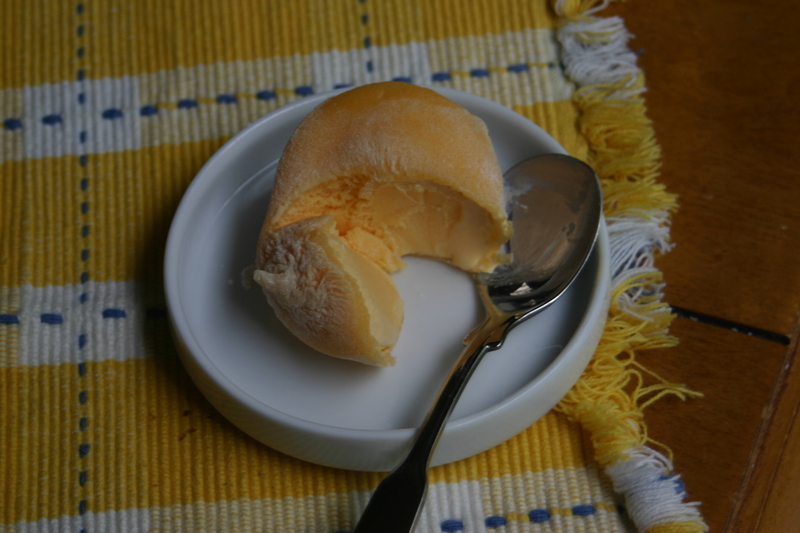 Is it like a mango ice-cream, but whats on the outside? Inquisitive! I think you did a wonderful job with both the eggplant and pork cutlet versions of the rice bowls. I’m a spice fiend so I usually douse my bowls liberally with Sriracha sauce but I like the addition of wasabi paste to your simmering sauce which is an innovation that I’d love to try on my next attempt at this dish. I’ve never tried mochi … is it like a sweet dough bun? LOL! I always try to be at the forefront of fashion. 😉 If you get to Trader Joe’s pick up this mochi. Yummy!